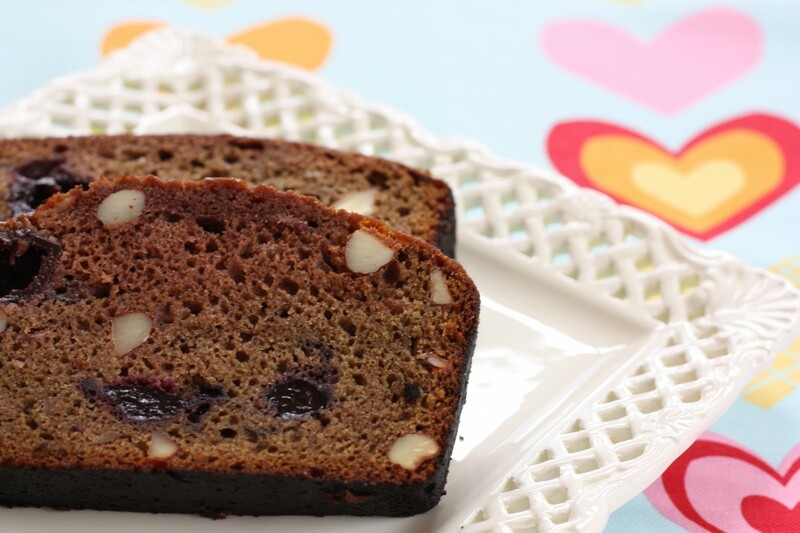 This perfectly textured and flavorful recipe for Chocolate Cherry Almond Amish Friendship Bread has a burst of sweet cherry and satisfying crunch of almond. This recipe has a lot of add-ins. If you have problems with add-ins (like fruit or nuts) sinking to the bottom of your batter, try tossing the add-ins with a tablespoon of flour, chopping up large or heavy pieces, or if all else fails, reducing the liquid content of the batter (your starter may be wetter rather than creamier or leave out one egg). This is one of our favorite Amish Friendship Bread recipes–it’s moist and full of flavor, and the coarsely chopped almonds pair beautifully with the cherries and chocolate. It’s easy to find the whole, pitted cherries at Trader Joe’s and most supermarkets. In a medium-sized bowl mix Amish Friendship Bread starter, eggs, oil, milk, vanilla and almond extracts. In a large bowl mix sugar, baking powder, baking soda, salt, flour, and pudding. Add wet ingredients to the dry ingredients and mix until just incorporated. Fold in cherries and almonds. Grease two large loaf pans and dust with a sugar-cocoa mixture of ½ cup sugar and 1½ teaspoon cocoa powder. Could you use dried cherries instead of the whole? Yes, absolutely! Just soak the cherries in warm water to plump them up a bit prior to folding them into the batter. The cocoa powder was left out of the list of ingredients. Luckily I had some, I’m sure it would be fine without the addition of the cocoa- sugar mixture sprinkled in the cake pan. I’ll let you know how this turns out. Nice catch, Joann! I updated the recipe post — thanks! How did it turn out for you? I think this is just about the perfect friendship bread recipe, but I plan on trying it with a chocolate glaze, too. I can’t wait to try this! Thank you so much for sharing all these lovely varieties!